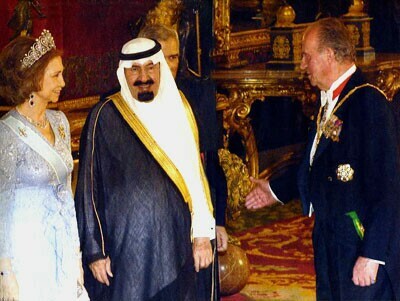 On June 18, 2007, King Juan Carlos of Spain conferred to Abdullah, the Muslim King of Saudi Arabia, the Catholic Order of the Golden Fleece. With this act, the Order lost its significance. After the Holy Land was lost by the Catholics and the main chivalric order – the Knights Templar – was shut down (1312), many attempts were made either to retake the territories lost to the Muslims or to fill the empty space left by the Templars. Two honorific chivalry orders that appeared between this time and the conquest of Constantinople by the Turks (1453) were the Order of St. George of the Garter in 1348, and the Order of the Golden Fleece in 1430. The Garter Order has a somewhat inauspicious origin. It was created by Edward III, King of England, during a ball given in Calais, France, when his mistress, the Countess of Salisbury, lost her garter during a dance. It fell to the floor in plain view of all there. How was that intimate piece loosened? What had she been doing a little before? The ladies and gentlemen present started to look at each other and imagine things. The nobility present actually stopped gossiping in order not to displease such an important personage. The Countess of Salisbury squeezed out of a difficult situation, and the English King, surprised at his unusual presence of mind, founded an order to perpetuate his gesture and his adultery. It is difficult to imagine that from this spirit a crusade could come. And, in fact, it didn’t. Further, in 1534 this order became Protestant with Henry VIII’s rejection of Catholicism. It was still a noble order until Queen Elizabeth II resolved to “modernize” it, making snooker champions and soccer players members. This year (2007), the latest of these celebrities to be granted such an honor was the author of Satanic Verses, the Indian writer Salman Rushdie, who should now be addressed as “Sir.” If anything worthwhile of the Order remained, it is quickly dying. 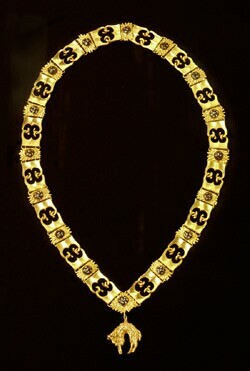 The Order of the Golden Fleece has a much different origin. In 1396 the Duke of Bourgogne, John the Fearless, the most powerful lord of the West, took part in a crusade against the Turks in Nicopolis. He fought so bravely that it was there he earned his nickname of fearless. The failure of the crusade greatly influenced his son, Philip III the Good, who wanted to take up his father’s fight. Based on this desire, as well as with the purpose of defending the Catholic Church against her enemies, he decided to found a chivalric order. Some historians link this initiative to an invitation he received in 1422 to become a member of the Order of the Garter. 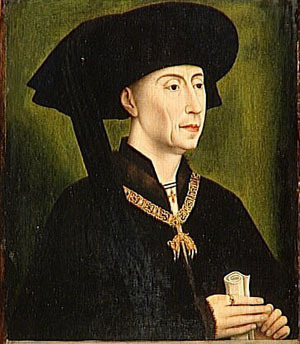 He declined the honor and instead, eight years later on January 10, 1430 when he married Princess Isabel of Portugal, he founded the Order of the Golden Fleece. The Garter Order was established to celebrate a royal adultery, Philip III made the Golden Fleece to celebrate a royal Catholic marriage: French panache. I established the noble Order that is called the Fleece. Also, the idea of the crusade was present. Shortly after Constantinople fell into the hands of the Turks, Philip the Good invited the knights of the Order to a banquet. On the banquet stage was an allegorical display, the Eastern Empire represented by a fallen woman being guarded by the lion on the Bourguignon shield. The challenge was met, and during the meeting 31 knights stood up and swore to embark on a crusade to liberate Byzantium. Undoubtedly a beautiful gesture, but regrettably one without military consequences. In those Renaissance times, alas, it was not rare to mix Catholic ideals with pagan symbols. Thus, the Greek legend of Jason and his daring quest for the magic golden fleece that would allow him to regain the throne of Iolsus from Pelias, his usurper uncle, was chosen as the symbol of that nascent order. How could a Catholic order be symbolized by a pagan hero? Many reactions rose up against it. Cardinal Guillaume Fillastre, however, would “baptize” Jason, linking him with the Biblical heroes Jacob and Gideon, pretending that the three of them would represent magnificence, justice and prudence. Also Fr. Raoul de Fèvre, chaplain of Charles the Fearless, wrote the Romance of Jason, in which the Greek prince was transformed into a medieval knight who was sad because of the dishonor of the world around him and set out to repair it. The magnificence of the House of Bourgogne – more brilliant than any royal house of the time – was transferred to the Order of the Golden Fleece. In many ways Philip’s son, Charles the Fearless, represented the apogee of the House of Bourgogne as well as its end. His constant rivalry with King Louis XI of France can be called the battle of the last medieval knight against the first bourgeois king, the fight of idealism and dedication against intrigue and mediocrity. This was celebrated in historic novels by Sir Walter Scott and Alexandre Dumas. Lacking a male heir, Charles married his daughter Mary to the Austrian Archduke and future Emperor, Maximilian. The Order passed with her to the Habsburgs. Emperor Charles V would reign over an enormous Empire that he left divided between the Habsburgs of Spain and Austria. This division would result in two branches of the Order of the Golden Fleece, which still remain today. The Spanish branch passed from the Habsburgs to the Bourbons in 1700. The present day King Juan Carlos is a Bourbon. The Austrian branch has 50 members, all Catholic and noble, to my knowledge. The Order is ruled by Prince Otto von Habsburg, the de jure heir of the Austrian-Hungarian Empire. The Spanish branch is ruled by Juan Carlos, King of Spain, and has 17 members. Juan Carlos, however, has introduced innovations that have denigrated the Order. Against its tradition as a Catholic Order, he made non-Catholics members: one Schismatic, Constantin of Greece; five Protestants, Elizabeth of England, Carl Gustaf of Sweden, Beatrix of the Netherlands, Margaret of Denmark, and Harald of Norway; two Buddhists, Akihito of Japan and Bhumidol of Thailand. And now, on June 18 of this year, he made a Muslim member – Abdullah of Saudi Arabia. By offering the Golden Fleece, whose purpose was to defend the Church primarily against the Mohammedans, to one of the Muslim’s more important representatives today, Juan Carlos completely dishonors one of the most prestigious honorific orders of Christendom. Reparation for such a betrayal of the ideal of Chivalry made by a reigning Catholic King is in order.